Celtic manager Neil Lennon is determined to add to his squad in the summer after seeing his side draw 3-3 with St Johnstone at McDairmid Park. Two late goals ended the visitors' chances of reaching the 100-points mark. "I think we do need to add depth to the squad for where I want to take the team," Lennon told BBC Radio Scotland. "I don't want what happened last year. We basically sold the crown jewels in the space of three weeks." Celtic lost the spine of their side last season when Gary Hooper, Victor Wanyama and Kelvin Wilson all headed south. "We'll try and avoid that if we can," he said. "I'd like to keep the core of the squad and add a few bits more. It's very difficult to do. "Whether the money's there and we get the right type is another thing. We're working on it obviously, I still think we need another couple of positions strengthened." Tim Clancy gave St Johnstone a shock lead and it could have been 2-0 only for Stevie May to have his penalty saved by stand-in goalkeeper Lukasz Zaluska. 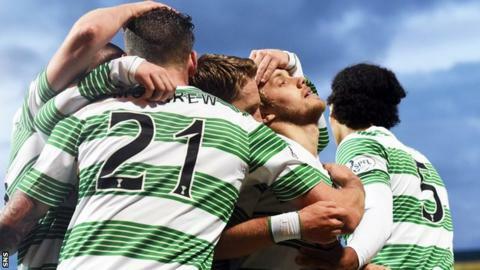 However, Celtic looked to be coasting to victory after goals from Kris Commons, Teemu Pukki and Virgil van Dijk. Saints' Scott Brown and Michael O'Halloran both hit the net in the final 10 minutes, though, to rescue a point for the Scottish Cup finalists. "It might have been due to the amount of changes that I made," said Lennon. "We looked a little bit disjointed, but I expect better quality. "Our first half performance was flat and it lacked real impetus apart from Teemu Pukki, who I thought had an excellent game and really deserved his goal. "In the second half, we were excellent going forward and I'm really disappointed with the two goals we conceded near the end. It was just lazy. "We looked a bit tired at the back tonight. [Mikel] Lustig, it's his first game in four months, so that's understandable, but the two centre halves got deeper and deeper for some unknown reason. "I don't know why we go so deep, we just seemed to switch off. They got a bit of luck with the second goal, but I think St Johnstone deserved a bit of luck on the night. "They missed a penalty and played particularly well first half, so probably over the 90 minutes a draw was a fair result."